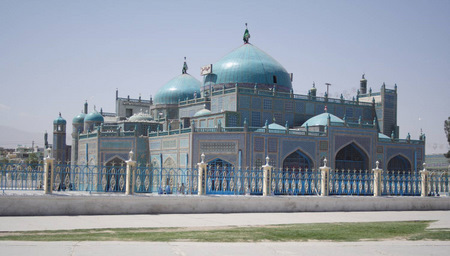 Mazar-e-Sharif (which means "noble shrine") is Afghanistan's largest northern city, and site of the country's holiest shrine. It is a desert city on the ancient Silk Road and it still controls most trade routes to Central Asia from Afghanistan. 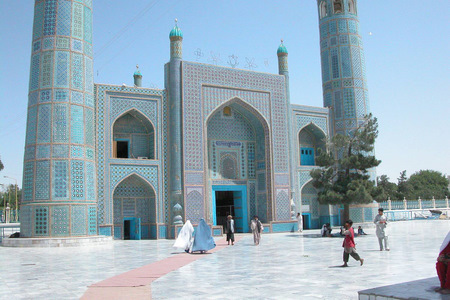 Mazar is the center of Afghanistan's New Year celebrations. The shrine of Ali dominates the city, which has no old quarter to speak of, since the whole city was supposedly razed sometime in the 1960s. The shrine draws thousands each year to Mazar at the spring equinox when day and night are the same length. For hundreds of years, pilgrims have flocked to the tomb to find forgiveness, healing or a miracle addressing a specific need. Also on March 21st, a huge religious flag (janda) is raised in the middle of Mazar and flown for forty days to celebrate the coming of spring. This festival is marked by buzkashi games and the gul-e surkh (red flowers) festival. This spring festival of the wild red tulips around Mazar is associated with prosperity and fertility. Close to Mazar are the many sights of Balkh which is a far older city, now much reduced in status. 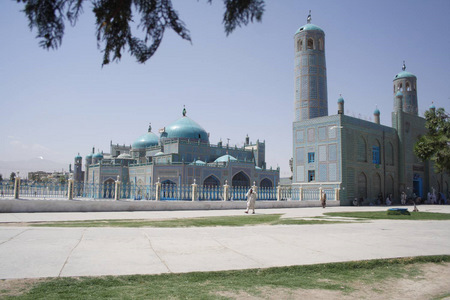 Balkh's historical sites include Afghanistan's oldest mosque, the ruined city walls, the grave of the poetess Rabia Balkhi and another ancient mosque nearby. The latter two are set in a lovely circular garden in the centre of Balkh. While the Muslim world as a whole contends that Ali is buried at Najaf in Iraq, Afghan tradition places his burial spot at Mazar-e Sharif (one of supposedly four graves for Ali). Legend states the city of Mazar-e Sharif came to exist because a white she-camel (some say a white horse) who supposedly carried the body of Ali, the Prophet Mohammad’s cousin and son-in law dropped dead here. According to legend, Ali’s followers feared his enemies would take revenge on his body and mutilate it after the battle at Qarbulah, so they exhumed him. The decision was thus made to have Ali buried wherever the camel stopped. Mazar-e-Sharif was her resting place. Following the dream of a local mullah in the 12th century in which Ali appeared to reveal his true burial site, excavations began at the village of Khairan, 20km east of Balkh. According to local legend, a small brick tomb in Mazar-e-Sharifwas uncovered containing a Koran, sword, and the perfectly preserved body of Ali. The site immediately became a place of pilgrimage, and a tomb was raised over the site. This tomb was later destroyed by the ravages of Genghis Khan, and lay forgotten for over two hundred years. A history of the tomb was rediscovered during the reign of the Timurid Sheikh Sultan Baiqara, who commissioned a new shrine in 1481. It was later rebuilt by Husain Barkara, the last Timurid monarch of Herat. 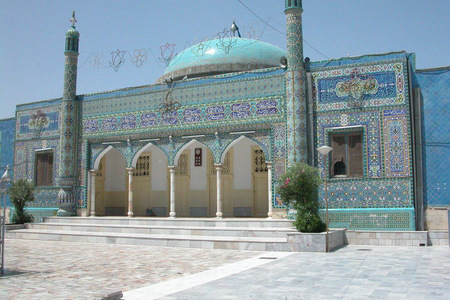 Much restored, this shrine still forms the center of modern Mazar-e-Sharif. All roads, stores and homes are built around it and it is the focus of much of Mazar life. Set in a large courtyard, the shrine of Hazrat Ali is a blue mosaic tiling architectural wonder, with a main southern gate leading to the tomb itself. Little of the original Timurid building remains, due to constant rebuilding and renovation throughout its history. Most of the tiling is mid-20th century from the tile workshop of the Herat Friday mosque. The shrine in Mazar-e-Sharif is in excellent condition. The shrine complex includes a library, a museum (northeast corner), a religious school, and a mosque which is located to the west of big shrine. There are lovely roses and trees in the garden around the shrine with certain areas for storytelling, fortunetelling, and a variety of other enterprises. The shrine courtyard is home to hundreds of white pigeons. Local tradition recounts that one in seven is a spirit, and that any grey pigeons in the flock will turn white in forty days due to the holiness of the area. They say the pigeons do not leave their droppings at this holy site. Entrance to the tomb itself is forbidden to non-Muslims, though the lovely gardens around the shrine are free for all to enjoy. Wednesday is ladies' day when they come to spend the day, dressing up and bringing picnic food. Guards at the gate keep out adult males until the late afternoon. Other days mornings are considered the ladies' time to visit the shrine, though this is not strictly enforced. Leaving Mazar and Going to Kabul?